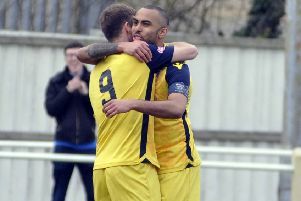 Hemsworth MW boss Wayne Benn was delighted with the response of his players as they bounced back from the midweek disappointment of a narrow defeat to leaders Worksop Town by beating Eccleshill United 5-1. The victory kept Wells in fourth place in the Toolstation NCE Premier Division and right in the thick of the battle to finish second as they are just three points behind Penistone Church and two behind Bridlington Town with seven matches remaining. Manager Benn did not think his team was at their best, but the result was important to pick the club up after their big disappointment. He said: “Tuesday was a tough one to take for everybody and it was a little bit flat when we arrived. We’ve had to work hard to pick them up, but they’ve responded really, really well. Hemsworth now face a big game this Saturday at home to a Bridlington side just above them in the table and Benn is looking forward to the challenge. He added: “It’s another big game. We always knew we had a tough run-in, but second place is still achievable and that’s what we’ve got to aim for. “We aim to finish as high as we possibly can. You never know what might happen in the leagues, whether there’s any restructuring or anything like that or that there is an extra promotion spot.